Recessed lights tuck neatly out of the way and are especially good in low-ceiling areas, like basements. But the mechanics of getting them to stay in place can be tricky. If you own recessed lights, no doubt you have one or two of them in crooked positions because a mounting clip refused to stay in place. Or if you are really unlucky, multiple clips have failed and the entire light is hanging down. Some clips work pretty well. The clips on small Cooper and Lithonia lights don't look like they should hold. You press the light upward, not believing that this will work, but in the last half-inch or so, the clips swing nicely into place. Halo brand clips, especially on the 6" cans, tend to pop. Usually, one sharp rap with the side of side-cutting lineman's pliers will snap those clips into place. Other times, not. The following fix is hardly the most elegant solution. However, recessed lights are not exactly elegant, either. Constructed of thin sheet metal, a few electrical wires, and a lamp base, there isn't much to your average can light. And the more you wiggle and fuss with the light, the more you weaken their structure. For this quick--and decisive--fix, you will need just one tool: a heavy-duty staple gun. You cannot use an office stapler or even a light-weight shop stapler. In this view of the inside of a ceiling plenum, you can see what the Halo clip is supposed to be doing. When you press the clips into place, the clip will move first upward and then downward to form a leg. Four of these springy legs combine to hold the light in place against the ceiling drywall. When properly engaged, the clip will lock in place. You can feel it as it clicks. When the clip does not engage, the clip will be loose. It might even look like it is flat against the inside of the light, but when you touch it, the clip rattles. It is not doing its job. Bending the Clips: Some homeowners and electricians say that bending the clips outward will help the clip better engage when it is pushed into place. Rapping the Clips: Another method recommended by electricians is to sharply rap the clip once--and just once--with a small, heavy object such as a pair of Klein side-cutting lineman's pliers. If one rap does not do it, subsequent raps will not help. The third method is the one detailed here: keeping a loose clip in place by jamming a small item between the clip and the light housing. Finish nails, wires, paper clips, flattened roofing nails do not work well. One acceptable item is a staple. If you manage to aim just right, you can fire a staple so that one "leg" of the staple jams between the clip and the housing (#2 in the image). The other staple leg nicely bends over to form an arm that holds the clip in place (#1). But what if your aim isn't so good? Well, there is an alternative. The alternate method is to actually puncture the recessed light housing with one leg of the staple, as indicated by the arrow. The other leg will form the arm that holds the clip in place. The reason this works is that the housing is made of thinner, cheaper material than the sturdier clip. What If You Need to Re-Do It? As noted before, recessed lights are best left alone. The more you work at them, the weaker they get. Reversing the "staple method" detailed here is no exception. 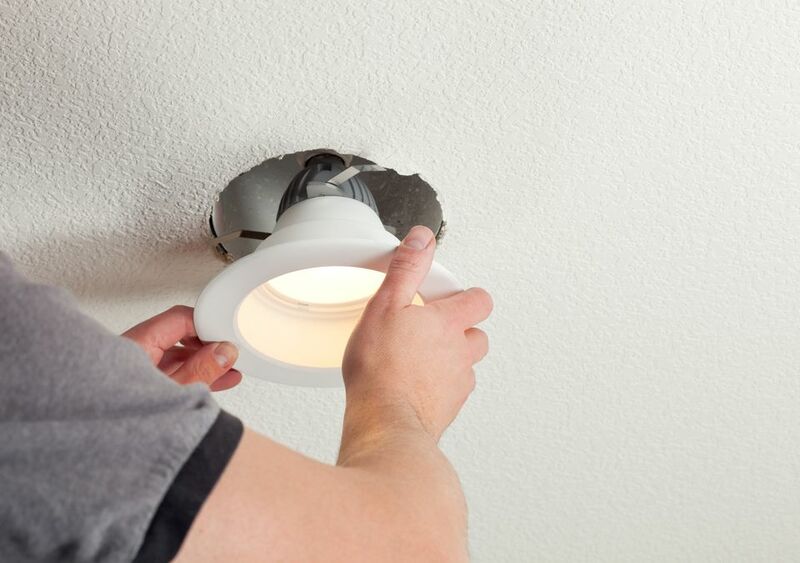 If you ever need to remove the light, use a flat-head screwdriver and pry under the clip to pull it outward. To get the clip in place again, just re-staple. Your light has a likely lifespan of one or two more restaplings before you simply need to replace the entire light housing.